31 Mar Earn Virtual XI Eddie! 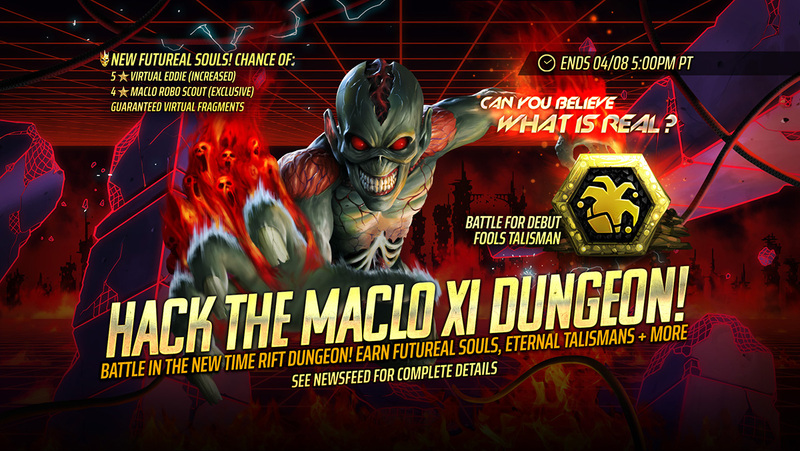 Hack the MACLO XI Dungeon NOW! From March 31st until April 8th at 5PM PT, battle in a limited time Dungeon for Futureal Souls and Eternal Talismans! The Futureal Soul is a limited time event soul which guarantees a 3⭐ to 5⭐ character of any class, with an increased chance of summoning Virtual XI Eddie, AMPA Robo Scout and SACRO Robo Scout PLUS an exclusive chance of summoning the MACLO Robo Scout! BONUS: Each Futureal Soul summoned will grant 10 Virtual XI Eddie Soul Fragments. Collecting 750 Fragments guarantees Virtual XI Eddie! Hack the MACLO XI Dungeon! The first time you complete one of the 3 dungeon floors available, you will be granted with set rewards including Futureal Souls and Angel Talismans. All subsequent victories are guaranteed to provide Sentinel Soul Fragments, as well as a chance of up to 2 bonus rewards, including Eternal Talismans. There are Event Challenges that will grant you Futureal Soul Fragments. Getting 200 fragments will earn you a Futureal Soul, with up to 10 Souls that can be earned from challenges over the course of the event. The store offers Futureal Souls for Ironite in the usual bundle sizes of 1, 3, or 10. In addition to Futureal Soul Fragments, completing event challenges will grant various other rewards, including Ironite, a variety of Legendary Souls and debut Fool’s Talismans. The Fool’s Talisman is a yellow talisman with a 3-set effect that inflicts a curious effect on all characters. Beware! Your curiosity could kill you. Virtual XI Eddie (5⭐ Sentinel): An offensive tank capable of taking down high-health targets. He can steal and grant various buffs to his allies, including the new Perfect Force Shield effect, if the enemy has Increase Max HP or Perfect Health effects. AMPA Robo Scout (4⭐ Warrior): A single-target, negative effect caster that can remove Immunity and Perfect Immunity from up to two enemies every turn! SACRO Robo Scout (3⭐ Magus): A random damage attacker capable of healing all allies, granting random shields, and extending the duration of beneficial effects on his team while increasing the duration of negative effects on the enemy. MACLO Robo Scout (4⭐ Sentinel): A true damage, multi-enemy attacker that can taunt all enemies, decrease their Max HP by 25%, and steal massives amounts of power from the enemy while granting his team a Perfect Titan Shield at the start of battle. MACLO Robo Scout is ONLY available in the Futureal Soul, and after this event, they will only be featured occasionally in Heroic Soul Rotations. If you miss your chance to recruit them now, it may be a very long time until you get another chance!